If you are looking forward to make your ‘wake-ups’ grand, nothing beats a steaming cup of ginger tea during winter mornings. Ginger contains anti-inflammatory properties, Vitamin C, magnesium and many other essential nutrients. It helps to control the feeling of nausea and morning sickness. 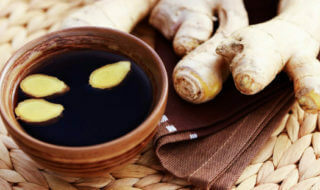 Having a cup of ginger tea helps to boost immunity and relieve stress. So, sit back and enjoy a cup of good health and taste! Grate the ginger with a grater/zester. If you slice it, slice it thin and use more of it. Infuse the ginger; if you add cinnamon, mint, chamomile or cayenne, add it here. If you are using a saucepan, add ginger to boiled water and reduce the heat. Put a lid on it and let it steam for 10 minutes. If you are using a teapot, add ginger in the teapot and pour boiling water in it. Let it cook in low flame for about 10 minutes. Also Read: Energizing Coriander Cucumber Juice for Detoxification!